We’re glad you’re curious about taking a trip with us! Please email us if you’d like more answers. We’re happy to help! For introductory courses, most day tours, and by-the-hour waterfront rentals, no. You do not need experience. It helps to be comfortable swimming, but paddling experience is not necessary. Let our friendly and knowledgable staff get you off to a great start! For multi-day trips, courses, and rentals, yes, you need experience. How much? It depends on what you’d like to do. For Primer trips , Foundations courses, and One Beach rentals, you need to have practiced the basic safety–falling out and getting back to shore or back into the kayak or onto the board. Also have reasonable control of your kayak or board in calm water. For Builder trips , Sea Paddler courses, and One Island rentals, you need to have good control in whitecaps, and be able to help others. For Expedition trips , Sea Leader courses, and Expedition rentals, you need to be a frequent, fit paddler with expedition experience. You should have the skills and awareness to be an asset to your group in good times and if the weather should catch you out at sea. We have a wide range of fun things to paddle! Our day trips, waterfront rentals, and One Beach rentals come with single or double Sit-on-Top kayaks or SUP boards. You can upgrade to a performance sea kayak. Our courses and multi-day trips come with performance sea kayaks. Our single kayaks are mostly Nigel Dennis Kayaks (Sea Kayak Baja Mexico is the only Nigel Dennis Expedition Center in Mexico!). We have other British-style single kayaks with skegs as well, including P&H, Wilderness Systems, and Tide Race. All of our trip kayaks are fiberglass. We have a few new Romany Sport plastic kayaks for training. We also have fiberglass double sea kayaks with rudders, made by Seda and Necky. The rest of the equipment is professional quality as well. For paddles we have Carbon or fiberglass Werner paddles and Don Beale Greenland sticks hand-made from Western Red Cedar and meticulously oiled to keep in good condition in the Baja sun. For spray decks, we have neoprene or nylon skirts made by Seals and Snapdragon. For personal flotation, we have products made by Kokatat, Stohlquist, and NRS. North Water makes the tow belts we use. Our kitchens and camps feature top-quality gear by MSR, GSI, Sea to Summit, and NRS. Our tents are MSR Hubba and Hubba Hubba. We use award-winning Therm-a-Rest NeoAir camping mattresses. What if I don’t see dates for the trip I want? It could mean we don’t have it planned in the near future, or that the database is awry. Give us a shout and we’ll see if we can 1) plan the trip or 2) let you know the dates and fix the database! How do I set up a custom trip? Please contact us! Planning at least 12 months in advance ensures the best availability, but try us anytime. If we can do it, we’ll take you out next week! We strongly recommend that you protect yourself with trip insurance. You can find our cancellation policy here on the Book a Trip page. For guided camping trips in Baja such as our Primers, Builders, and Expeditions, each specific trip has a detail of what’s included. The Trip Overview page has general information as well. For multi-day rentals, you have choices: Bare Bones, Equipped, and Provisioned. Bare Bones has just what you need to get on the water–kayaking equipment, transportation to the launch and back, and permits. Equipped sets you up with a kitchen and some hard-to-manage things like fuel and water. Provisioned does all the above plus pre-packages your meals so that all you have to do is show up and go! More details on rental packages. All day trips include a guide, National Marine park permits, and basic paddling equipment. Depending on the trip, it may include lunch and a panga (motorboat) to an island. The default water craft for day tours are sit-on-top kayaks and stand-up-paddleboards. You may upgrade to a sea kayak on most trips. Please see specific day trip descriptions for details, or inquire. Courses vary widely. Please see course descriptions or inquire. 1. The most significant to your experience and our bottom line is the size of the group. -Multi-day tours and courses have a maximum 8 on most trips, as opposed to 12-15 of most companies. This affects everything from the length of lineup for food and bathroom, to choices for a tent site and crowdedness of the beach, to the flexibility of choices the group makes, to the intimacy and quality of your experience. -Day tours bring kayaks or SUPs to the island in the motorboat, which means fewer people (2-4) fit. Most companies pack the panga with people and don’t bring kayaks. Having a kayak or SUP at the island gives a tremendous sense of freedom and greater opportunity to explore. It’s a very custom tour, catered to your preferences. 2. Our staff is absolutely tops, and they care about your experience. -Our guide staff has a cumulative total of over 85 years of experience guiding in the Park, with some individuals having been sharing the experience and living their dream this way for over 20 years. No other company comes close. -Any family or tight-knit community takes an investment of time and energy to maintain. Even more than the equipment, which we value very highly, we value our people. We encourage, invest in, and mentor their personal development as guides, coaches, and human beings. To date we have had zero turnover of guiding staff (except in roll practice). Every single one of them is fully committed to the SKBM team and to your safety and experience. Once you’ve been out with them, you’ll know what we mean. -On day tours, you have a guide in addition to a panga captain. Your guide will speak your language (at least if it’s English or Spanish), will be informed about local flora and fauna, basic geology of the region, history, and culture. Your guide will be a capable leader in the watercraft you are using. Many other companies just send the panga captain. 3. The quality of our equipment sets us miles apart. -Nigel Dennis, Kokatat, Werner, Snapdragon, Seals, MSR, Sea to Summit, Therm-a-Rest. We also invest in taking care of our stuff. The high salt content of the Sea of Cortez, the punishing summer heat, and the strong year-round sun take their toll on everything, as you’ll notice with discount operators. Our kayaks have a full time maintenance program and staff to keep them in top shape. -On day trips to the islands, we bring shade tarps, beach chairs, and a serving table for lunch, as well as the paddlecraft, which many other companies don’t. 4. We won’t cancel your trip for low enrollment. -So long as there are 2 people, the trip will run. -We honor the commitment you’ve made to plan this trip, and we make a commitment, too. This has paid off over the years as appreciative paddlers come back with their friends, over and over. If you’re not careful, you might develop the habit too! 5. We only count the trip days, not your arrival and departure days. 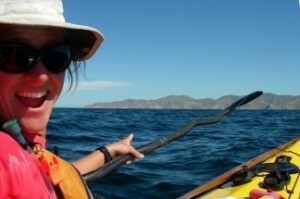 -A 6-day trip is 6 days with the kayaks and guides. Get here the day before and leave the day after. That counts as an 8-day trip for many outfitters. 6. Single kayaks cost more to send on trips. -Many levels of registration and permits are required to do business in the National Marine Park of Loreto, which ideally contributes to the long-term sustainability of eco-tourism in the area, and to the sustainability of the region itself. These registrations and permits are per kayak, which means that putting 2 people in each kayak costs less. The vast majority of our participants go in single kayaks. 7. There is simply no comparison. -Your trip is a unique, special experience, not an assembly line. -For us at SKBM, taking people on the water and into the desert is a passion before it is a business model. We are a small (but growing!) company run by paddling enthusiasts for paddling enthusiasts, and for people who are simply enthusiastic about life and want to have terrific experiences! -It actually costs significantly more money and personal energy to do what we do, but we occasionally ask for just a fraction more than other companies when they have comparable trips, which, indeed, you could argue that they don’t. -About 50% of our business is repeat clients. -Many clients come back bringing friends and other family members. -Most of our clients initially hear about us through word of mouth, which means that people are talking about their great experience. -This all means we must be doing something right! Please join us and see for yourself!